THOUGHTSKOTO Thoughtskoto : WHO CAN AVAIL FREE MEDICINES FROM THE GOVT AND WHAT ARE THE REQUIREMENTS? "Isang Bilyong Pisong Tulong na Gamot mula sa Pondo ng Pangulo" is now available for indigent patients all over the Philippines. In the official page of Department of Social Welfare and Development (DSWD) Secretary Judy Taguiwalo, confirmed the news on Friday, January 6, 2017. The P1 billion for free medicines came from the P5 billion remitted by the Philippine Amusement and Gaming Corp. to President Rodrigo Duterte last month. Taguiwalo said under their guidelines, DSWD social workers can immediately approve the giving of medicines to indigents if they are worth P5,000 or below. The government can also pay for medicines that cost as much as P25,000 but this would have to be subject to approval by the field office. The DSWD chief clarified that no cash will be given to the poor patients but would provide them with guarantee or referral letters. The indigent patient will then present the letters to drug stores so they can be given free medicines. The free medicines can be availed of every three months. 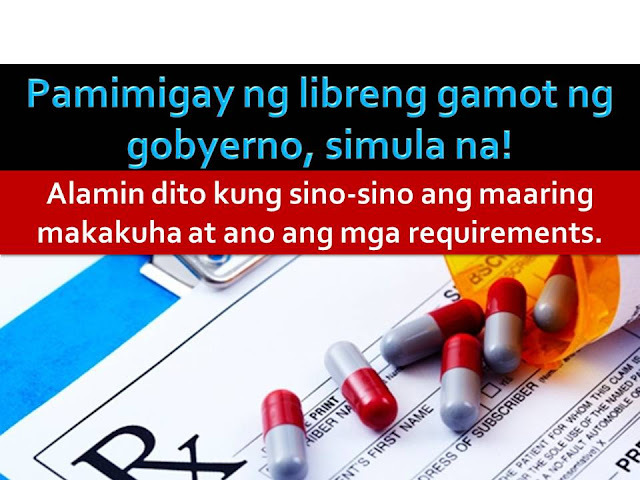 WHO CAN AVAIL OF THE FREE MEDICINES? The needy, vulnerable, disadvantaged poor and from the other informal sector. Other indigents base on DSWD assessment. The DSWD will implement, manage, monitor and gives report and evaluation of the program. The program will be implemented with the help of Crisis Intervention Unit (CIU) of the agency. For those who wants to avail this program, you may visit the nearest DSWD field or satellite offices in your area. Be sure you are qualified to avail and do not forget to bring the requirements mentioned above.